The door to hell is often portrayed with a fire lit atmosphere of the terrible heat. 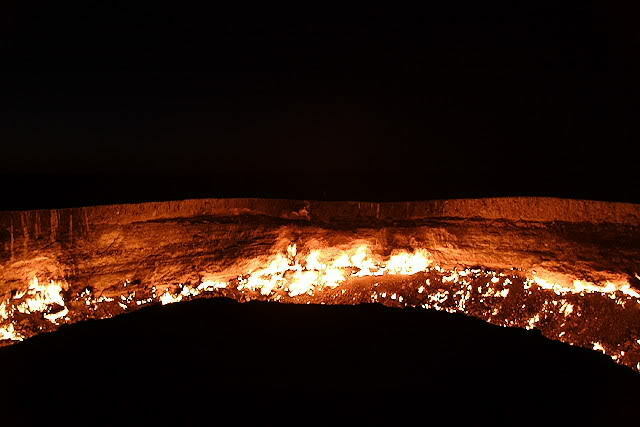 Conditions such as that contained in a fire a gaping hole in mainland Usbekistan, Central Asia. Then the fire pit that was referred to as the "gates of hell". Fire pit that measures approximately two times the football field with a depth of more than 30 meters. Original size is not that much since the first time in 1975 "gates of hell" was encountered humans. Initially geologists digging with heavy equipment for the drilling of natural gas. Surprisingly, at the site was found a big gap in the underground. So big, all the equipment to dig it plunged into. The gulf was filled with poisonous gas. There has been no official statement at the time the Soviet Union was linked to how many deaths result from exposure to toxic gases. But experts get out and all the equipment that mired it left off. To avoid poisonous gases are already open to the sky the earth is spread, experts decided to burn it. His position was near the small town Davaz. Practically since 1975 that a giant hole belching fire like a volcano and remain lit until now though already 35 years passed. Communities around no one dared approach the influence of the hot field of up to several hundred meters, so-called "gates of hell". 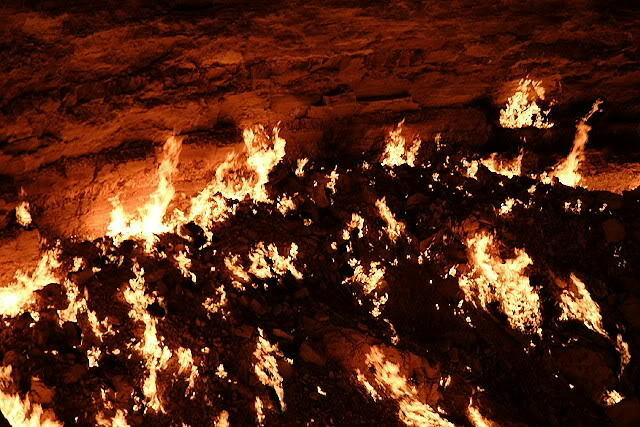 Until now there has been no explanation of whether the "gates of Hell" was widened or stable in size due to gas coming out from the bowels of the earth is burned directly. Although exposed to rain, the fire did not die. Giant fire pit that looks from a distance because it is located in a vast barren land. When the night, it seems increasingly clear with yellowish light beam originating from the "gates of hell" is. Similar to the mudflow, which continue to churn out hot mud because of drilling assessed failed to gush to the surface of the earth. Until now there has been no geologist is also capable of stopping Lapindo mudflow. What can be done only limit to the area that does not effect the hot mud continues to widen.